"The metal horned unicorns are doomed " That's what Lauda Lead Horn wailed when she first saw the tribe's new savior. OK, so his horn was not metal.and he did not have a magic power.and he was really a puny little runt. But doomed? Were things really that bad? Well, things were pretty bad in the land of MarBryn. Magh, an evil sorcerer utilized unicorn horns and hooves to create his magical potions and spells. Those he used, to increase his power and to conquer everyone in his path. All of the unicorns from the Tribe of the Metal Horn were now gone . except for twelve survivors. Before the blue unicorn was born, Numen told Alumna, the aluminum-horned oracle, that he had a plan to bring the tribe back home to Unimaise. His prophecy to Alumna was, "Only the blue unicorn can join with the Moon-Star. Until then, no new unicorns will be born." Blue was the last unicorn born. Twenty years later, his horn was still covered with a plain blue colored hide. There was not a glint of metal to be seen on it or his hooves. Everyone knew no metal meant no magic. But Blue had a mission and he meant to see it through. He was no longer scrawny and he had his wits. Though no one else in the tribe thought he had a chance of defeating the evil sorcerer, Blue felt ready to make Magh pay for his evil deeds. And he went off to do it alone. That was Blue's first mistake. If the entire tribe was not standing horn-tip to horn-tip at the proper time and the exact place to help usher the Moon-Star Spirit into Blue's horn, he would die. Then, the rest of the tribe really would be doomed. 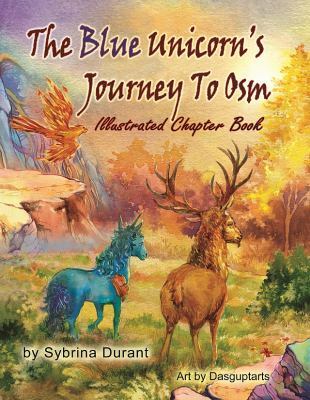 Blue is joined in his travels by his mentor Gaiso, the Stag and his friend, Girasol the Firebird as they try to find their way across a danger-filled MarBryn to Muzika Woods. Will the rest of Blue's tribe reach him before the Moon-Star arrives? Read this action packed adventure to learn about the blue unicorn's quest to fulfill his destiny and to save his tribe. This book, written by Sybrina Durant and illustrated by Dasguptarts, is presented in chapter book style with lots of pictures in order to keep young readers Interest. It is meant for middle grade readers and up. Get the companion coloring book, too, at any online bookstore.